1. Prayer. No-brainer, maybe. Basic. Even un-exciting? We don’t think so. The reason prayer is primary is that we are a Jesus-centered community. We’re not simply about getting together and feeling good about ourselves. We’re not into mere self-help or making friends or finding purpose or even serving the needy. We are about Jesus. He is our vision and our reward. He is our Master. It is for love of Him that we serve and for His glory that we gather. Intimacy with Him is our delight. Serving Him our privilege. We value prayer because anything worth doing or being must be absolutely centered on Jesus. We are passionate about prayer because we are desperate for God and acutely aware of our own weakness. We put prayer first because our Father loves us, and we love Him too. ​2. Family. We have no desire to do this alone. Some of us have tried that, and it’s just no good. We have high aspirations in this. We want to be more than community. Community is so temporal, and temperamental. It’s held together by geography or common interest or common belief or common cause. We want to be something held together by the greatest bonds – those of love. This is called family. It feels risky even to write that or speak it out loud, because I wonder if such a goal is truly attainable. Yet I think it’s the promise of the Scriptures. It’s God’s desire for us. “This kingdom of faith is now your home country. You’re no longer strangers or outsiders. You belong here… God is building a home.” (Eph 2:19). We belong. God is building a home. These are central and powerful truths that describe who we aim to be. Of course, we cannot create this – which is why we begin with prayer. With Jesus at the center, God can make us a family. His family. 3. Mission. God is on a mission. Jesus said, “For the Son of Man came to seek and to save what was lost” (Lk 19:10). The more we love Jesus, and the closer we get to His heart, we ourselves become more and more passionate about His longing to bring redemption to the lost and hurting and broken and bound people that He created and loves. This also means that we are on a pursuit of becoming more like Christ. We are so grateful for His grace that accepts us just as we are. We are equally grateful for His grace that calls us and enables us to become something more. We echo Paul's yearning for the Colossians: "That we may present everyone perfect in Christ" (Col 1:28), and to the Galatians: "I am again in the pains of childbirth until Christ is formed in you" (Gal 4:19). We hunger for God's righteousness to fill our lives. We long for the fire of His holiness to consume in us all that is not like Him. We are committed to actively submitting to the Holy Spirit's work of making us like Jesus, and to helping one another in this pursuit. And we are committed to actively seeking the lost, to invite them into the Father's gracious and loving family. A gathering of Christians cannot properly call itself church if it exists simply to meet its own needs and continue… existing. If it is all about personal growth or spiritual experiences it might be a nice group, but it isn’t the Church that Jesus said will not be defeated even by the gates of Hell. Too easily we can become a food distribution experience for the overfed. Church does not exist primarily for me to “get fed,” but for the glory of Jesus to be seen in the nations through the redemption of His creation. This is the mission of Jesus, and we really want to be part of it. Not as hired hands who are looking for a paycheck and a pat on the back, but as beloved sons and daughters who have been called to participate in their Father’s great work. Most of us are not very good at mission. Nor at relationships. And certainly not at prayer. So it seems a bit hypocritical to say this is who we are. And yet… Yet, this is who we long to become. This is in our hearts. This is a longing and a desperation. This is a commitment. And the encouraging thing is that we can go after it together, empowered by the grace of God. I think it’s God’s dream, and in that there is hope. One of the primary reasons the boiler room exists is to reach the lost with the message of the Gospel and the love of Jesus. We aim to welcome many into God's wonderful family who are currently living "without hope and without God in the world" (Eph 2:12). This naturally means that, as a boiler room family, God intends us to grow. As much as we may enjoy our nice little group, we are not here primarily for ourselves (!). I am convinced that the way God is calling us to do this is through the multiplying of small, family-style simple church gatherings. Simple churches can meet anywhere - but often do so in homes. The gatherings are inclusive, in that everyone present has the opportunity — even the responsibility - to share what the Spirit is showing them and to exercise spiritual gifts. They are personal, because each person can be vulnerable about needs and struggles, knowing they will receive support, prayer, and encouragement. They foster spiritual family as we truly get to know one another and particpate in God’s mission together. We often eat together. We worship, discuss the scriptures, and pray for one another and the world around us. 1. REACHING PEOPLE. I believe that this is how God is calling us as the boiler room to reach more people for Him. 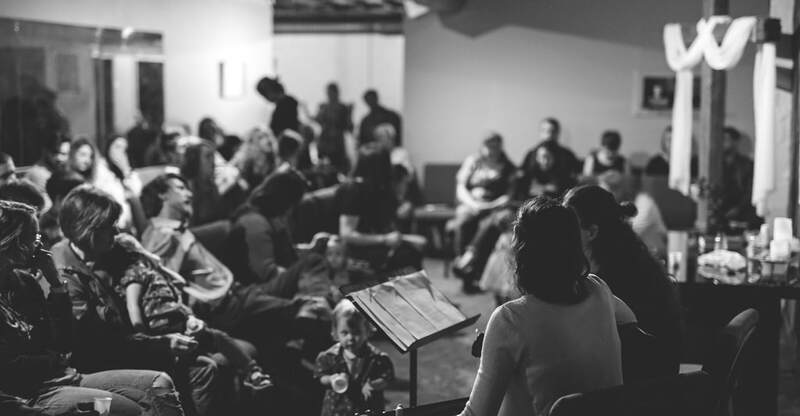 I love the experience of intimate, spiritual family that the boiler room has become for me, and I want to offer that to many others whom Jesus loves. 2. MORE OPPORTUNITIES TO BE DEEPLY INVOLVED. As we focus on small, family-style gatherings, the role that each of us plays in the boiler room becomes more significant, and I think that is really good. There are more opportunities for leadership and service. There is more expected of us as active members of spiritual family. Your spud counts on you in more ways than would be the case in larger groups. 3. EVERYONE IS "IN". The bigger we get, the more easy it is to be on the outskirts of the group. My heart is that each person that comes to the boiler room has the chance to genuinely be in the "inner circle." In fact, my aim is to do as much as we can to eliminate the possibility of outer circles. There are no secondary members of God's family, and I long to see that truth displayed each week in the boiler room.